There will be some measurement error of the product,Please refer to the physical object. 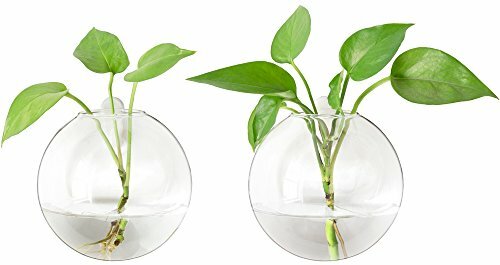 There are 2 wall hanging glass Plant Terrariums and with hooks inside. With this item, you can decorate your house, garden, office, wedding, party. It is a good decoration for beautifing and purifing your house or office, and makes you feel relax. The item is mainly put the plants like hydroponic, air, succulent, artificial flower. There is a hole in the back that allow you to mounted to the wall. At the very top that allows you to add plants. It is a good item for space-saving. The shape of the glass is a circle, it is a glass of High boron silicon heat resistant. Size M: 4 4/3" Length X 4 5/8" Width X 4 7/8" Heigh. Mkono is a registered trademark and our product is professional manufacturing and sole selling.